TCUGB: How long have you been practicing Tai Chi and what got you going? KDN: I had to get fit following a hernia operation. On a boring morning jog I saw a sign on a church hall: ‘Karate!’ For four years I practiced Shotokan finding, in my forties, it took longer to recover from injuries than when I had boxed, played rugby and polo in my teens and twenties. Seeking self-healing I discovered Shiatsu, and Tai Chi. A group of friends and I would gather in Holland Park of a Sunday and practice under the tutelage of young Master John Ho before going to Chinatown for Dim Sum. I met Kung Fu Master Kapo Don, who told me of the work of Mantak Chia. On my way to Japan for postgraduate Shiatsu training I stopped over in Thailand and spent three weeks learning with Master Chia. Three weeks turned into three years of following him around the world, unlearning my ‘Tofu’ Tai Chi, and learning his form as a spiritual practice. On my return to UK in 1992 I founded the Zen School of Shiatsu and London Healing Tao Centre, sharing what I had learned, from healing to martial arts. For the next twelve years I regularly returned to wherever Mantak Chia was teaching, Asia, United States or Europe, and hosted his visits to London. On one of my trips I met Master Yves Bourgeois who showed me a form of push-hands I had not encountered. Two years later I went with Yves to Penang and trained with Yves’ teacher, Master Lim, a direct pupil of Master Cheng Man Ching. By now I was 64, and Master Lim 86. With one flick of his shoulder he sent me flying. I had discovered the ‘Chuan’ of Tai Chi! TCUGB: What does Tai Chi mean to you? KDN: For me, Tai Chi combines spiritual practice, healing – or health maintenance – and martial art. In the double-helix spirals of the form we reunite the Yang and Yin forces of our creation, to ebb and flow throughout our meridian network, feeding the organs that sustain our life. We open and stimulate the meridians, the energy-flow channels, enabling the bio-electro-magnetic force, Qi or chi, to come on full charge. TCUGB: What is the most important aspect? KDN: Practice! Whether for meditation, health or self-defence, ‘practice makes perfect.’ Of course it’s quite easy to practice doing it wrong, but then what is wrong? I had a student many years ago who just wanted to learn the form, wasn’t interested in anything else, and as soon as he thought he had enough to practice with, disappeared. I bumped into him in the street a few years afterwards, asked him how it was going for him, and he said, ‘Great! I haven’t had a cold or headache since learning Tai Chi.’ He said he practiced most days, and insisted on showing me, right there in the street. It was … different, unlike any Tai Chi I’d seen anywhere. Had he taken classes with anyone else? ‘No,’ replied, ‘Just you.’ I told him not to tell anyone that! The truth is, though, what he was doing worked for him in the way he wanted. It made him happy and kept him well, so who was I to judge. TCUGB: Who or what inspired you? Kapo grew up to become a senior kungfu player responsible for organising the Lion Dance at Chinese New Year, and his story inspired me, then struggling to find my own way, to learn Tai Chi myself and, later, Zen painting. It was Grandmaster Chia’s Chief Instructor at the time, Master Rene Navarro who both inspired and instructed me in two most interesting aspects: one was Escrima, or Arnis de Mano, introducing me to weapons training that I now pass on to my own students at our annual Retreat and Training Camp, where I adapt the weapons forms for realistic self-defence using the weapons of today: fantastic confidence-builder. Rene’s other inspiration for me was Tai Chi as shamanic theatre: celestial combat rooted in Earth and played in the human dimension. Yang advances, Yin withdraws, Harmony prevails. Rene described the Way of the Fang Shi, Hidden Masters of no lineage (e.g. Bruce Lee), giving a sense of reality to this ancient art as we emulate the heroes of then, the warriors, the fighting nuns and monks. Later research into the shamanic origins inspired me to write the book ‘Taoist Shaman’ which itself has inspired others to grow more aware of the depth of our tradition. Then, just recently, a colleague from another branch of the martial arts sent me a DVD that took me right back to the Eighties when I watched it on television and which prompted my first explorations into ‘The Way of the Warrior,’ and reminded me of other inspirations, from David Carradine to Bruce Lee. Now my inspiration comes from my students who, at every session, reflect my teaching: faults and all! TCUGB: Do you have any personal goals in Tai Chi? KDN: I do. I want to develop the Tai Chi Teacher Training Programme that I began this year with my more experienced students. I want to develop a Qigong Teacher Training to complement the Tai Chi. I would describe Qigong as the grammar, Tai Chi the literature, or Qigong the training, Tai Chi the performance. I want to make more people aware of the special benefits of Tai Chi training: lots of things are good for us: yoga, aerobics, pilates etc, but the unique benefit of Tai Chi is its potential application for self defence, without having to embark on a rigorous training or commitment to a specific life-style – although certainly these are options for those who have the desire, as well as the resources of time and money. My goal is to make more people aware of this unique benefit in the hope they never need to use it. TCUGB: What direction would you like to see Tai Chi going in the future? KDN: I would like to see it made more accessible. I would love to see it taught in schools. On the other hand, as an educator (my Shiatsu School was the first to gain University Accreditation) I am aware of the need for standardisation in those circumstances, and I would not like to see Tai Chi sacrifice any of its unique diversity. TCUGB: What do you make of Tai Chi’s current popularity? KDN: I think it’s absolutely fantastic that so much research is going into Tai Chi that more and more people are becoming aware of the benefits. It offers so much to different ‘markets’ if that’s the right expression. It works as meditation, for health, for practical self defence, and as a specialist martial art. And since I make my living from Tai Chi, I consider this to be a good thing! TCUGB: As a teacher, how do you feel about the martial aspect of the art? KDN: I feel that whether or not a student wants to ‘be a martial artist’, awareness of the origins of the art and the applications for each movement are pre-requisite for understanding each move. It is also helpful for a teacher to know and be able to explain the benefits of Tai Chi as more than simple exercise. TCUGB: What are your views on competition? KDN: I teach Master Lim’s simple Push-Hands techniques for flexibility and balance. The players compete with each other. If they feel the need to compete and I mean ‘enter competitions’, I encourage them to find a club where they have this facility, while emphasising they remain welcome to continue training with me. My view is simple: compete if you are competitive, or undertake the spiritual discipline of not competing. Don’t compete if you are not a competitive person, or do undertake the spiritual discipline of competing. It’s always easier to do what we’re good at. To be better, we could improve what we’re not so good at. It’s a very satisfying achievement. This entry was posted in Uncategorized and tagged Arnis de Mano, Bruce Lee, Cassius Clay, David Carradine, Escrima, grandmaster mantak chia, healing tao uk, kris deva north, london tao, mantak chia taoist training center, Muhammed Ali, qigong, tai chi, Tai Chi Summer Camp, tai chi training, unversal healing tao, Way of the Warrior, Zen painting. Bookmark the permalink. 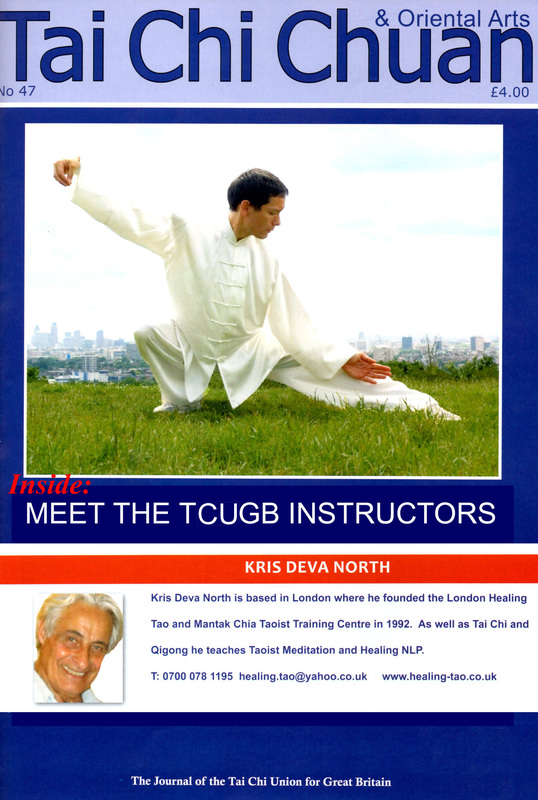 I am so lucky to have trained with Master Deva North and also Mantak Chia. Hi Kris. Long time no see. Comming out of m’y cave after several years.